Introduced at 2018 Houston Quilt Festival, CIRCLES & STRAIGHTS TOOL is designed to secure to the front and back of your any table ranging in size from 16"-18"" in depth. 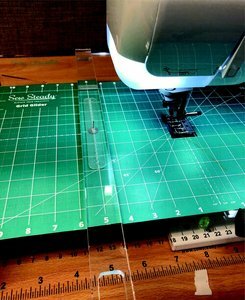 Provides a straight guide for seams as well as sewing circles. NEW Circles + Straights Tool allows you to sew straight seams and sew circles on your Sew Steady Table. 18" size works on our Large 18" x 24" Table.